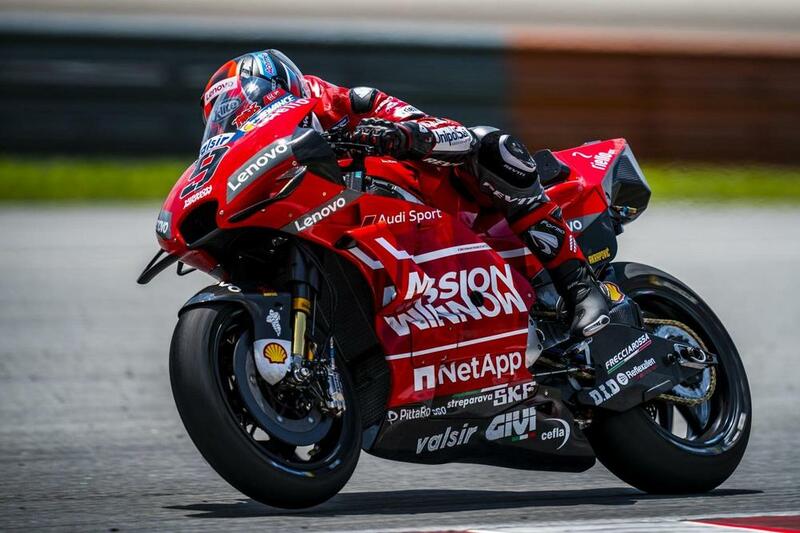 Ducati pilots Danilo Petrucci, Francesco Bagnaia, Jack Miller, and Andrea Dovizioso ran 1-4 to end the Sepang test with a showcase of Ducati power. After Maverick Viñales (Monster Energy Yamaha MotoGP) missed out on setting the fastest ever lap of Sepang by just 0.067 on Thursday, Friday saw action in Malaysia end on a high as not one but six riders went quicker than Jorge Lorenzo’s quickest effort in 2018. The quickest of them all, however, was Danilo Petrucci (Mission Winnow Ducati) as the Italian stormed the timesheets with an awe-inspiring 1:58.239 after 32 laps – with rookie Francesco Bagnaia (Alma Pramac Racing) hot on his heels and only a fitting 0.063 in arrears after 21 laps. Next came his teammate Jack Miller only another small margin further back, the Aussie doing 47 laps and quick despite a crash, with Andrea Dovizioso (Mission Winnow Ducati) completing the top four, three tenths off the top. All in all, a stunner of a day for Ducati machinery. Behind Viñales, the final man to beat the 2018 fastest lap was Cal Crutchlow (LCR Honda Castrol) as the Brit took P6 overall and was fastest Honda once again despite returning from injury. The three-time Grand Prix winner crashed on Day 3 once again but managed an increased 61 laps – a positive showing after so much time away – and did a best of a 1:58.780. His teammate Takaaki Nakagami (LCR Honda Idemitsu), meanwhile, impressed once again as he completed Day 3 in P9 and in the top ten – making that three days in a row. The Japanese rider was happy after the test and put in 61 laps on Friday.